If you have been recently arrested for DWI or DWAI in New York, it is likely that you were asked to perform a series of field sobriety tests, including the One-Leg Stand Test, the Walk-and-Turn Test, and the Horizontal Gaze Nystagmus Test. These tests are used by police officers to establish probable cause for a driving under the influence arrest. If you were arrested after failing a New York DWI field sobriety test, it is important that you hire an experienced DWI attorney as soon as possible. In New York, police officers often use a series of field sobriety tests to determine if a DWI or DWAI arrest can be made. To conduct a proper one-leg stand test, the officer must first make sure you are on a hard, level, non-slippery surface. If you are older than 65, more than 50 pounds overweight, or who have a physical impairment that would affect performance you should not be asked to take the one-leg stand test. The one-leg stand test consists of two stages: instruction and performance. During the instruction stage, you will be asked to stand with your arms by your side and your heels together while listening to the officer. During his or her instructions, the officer must demonstrate the test. After explaining the one-leg stand, the officer will ask if you understand the instructions. In the performance stage, you must stand on one foot (your choice) and keep the other foot raised six inches off the ground. You must then count aloud for 30 seconds, saying “one-one thousandth, two-one thousandth,” until you reach 30. During the test, you have to keep your hands by your sides and look at your feet while trying to maintain your balance. During this stage, the officer is looking for five behaviors: 1) raising arms in order to balance; 2) hopping; 3) swaying; 4) putting your foot down; or 5) failing to complete the test. Two or more of these signs can lead to probable cause for arrest. During the walk-and-turn test, you will be instructed to walk nine heel-to-toe steps, pivot, and then walk back the same way while looking down at the ground and counting your steps. You may be also asked to walk on an imaginary line or a white line on the side of the roadway. The police officer will demonstrate the test in the instruction phase. The police officer will look for six clues to determine probable cause to arrest: 1)stopping; 2) failing to walk heel to toe; 3) using your arms for balance; 4) losing balance while turning; 5) taking the incorrect number of steps; and 6) not adhering to the test instructions. The walk-and-turn test should be administered on a hard, level, non-slippery surface. In order to correctly administer the test, the officer must give clear instructions, and you must state that you understand them. Several factors, other than intoxication, can lead to failing the New York DWI walk-and-turn test such as being more than 50 pounds overweight, being over 65 years old, having a physical condition that affects your balance, wearing high heels, or possessing limited vision in one or both eyes. 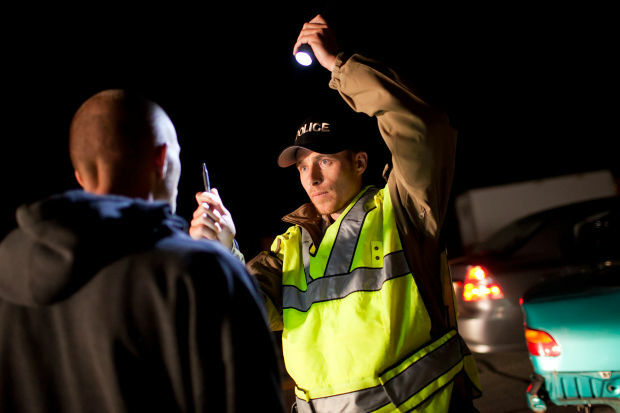 It is important to note that field sobriety tests are not accepted by the scientific community as an accurate way to determine blood alcohol or to prove intoxication. Furthermore, field sobriety tests are subjective, and the officer may have already made a pre-determination that you are under the influence of alcohol or drugs. If you failed the New York DWI walk-and-turn test, there is still hope. An experienced DWI attorney can aggressively fight your charges in order to secure the best possible outcome for your case. The horizontal gaze nystagmus test is considered the most scientifically accurate of the three field sobriety tests. Nystagmus is an involuntary jerking of the eyes that occurs when you look to the side. If someone is under the influence of alcohol and/or drugs, he or she may display nystagmus when trying to follow a small object with his or her eyes. 1) The first sign is lack of a smooth pursuit, or the inability to follow the stimulus smoothly with your eyes. 2) The second sign is distinct jerking of the eyes when you are looking as far to the side as possible (maximum deviation). To look for this, the officer will ask you to follow the stimulus to the side without moving your head. After your eyes have reached maximum deviation, the officer will watch your eyeball in that position for two to three seconds to look for nystagmus. 3) The third sign is distinct jerking of the eye before reaching a 45 degree angle. To look for this, the officer will have you follow the stimulus to the 45 degree angle, and hold your eye there for four seconds while looking for nystagmus. Four or more signs are probable cause for a DWI arrest. While this test may be used to determine intoxication, there are several other factors can cause nystagmus while not under the influence of alcohol or drugs. These include prescription medications, neurological disorders, brain tumors, head injuries, prescription medications, certain eye conditions, and others. Because the police officer is not a doctor, he or she cannot make an accurate diagnosis on what caused your nystagmus during the test. At Astarita & Associates we have vast experience in handling DWI/DWAI cases and challenging field sobriety tests. We are keenly familair and well-versed on the specific techniques and nuances that are needed for these tests to be rendered admissable. Our experience as DWI defense attorneys, combined with our backgrounds as former prosecutors with the Suffolk County District Attorney's Office, allows us to specifically understand the prosecutorial process and anticipate the prosecutor's strategies. As your attorney we will vigorously investigate your case and determine if the field sobriety tests were conducted properly.